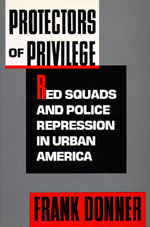 This landmark exposé of the dark history of repressive police operations in American cities offers a richly detailed account of police misconduct and violations of protected freedoms over the past century. In an incisive examination of undercover work in Chicago, Los Angeles, New York, and Philadelphia as well as Washington, D.C., Detroit, New Haven, Baltimore, and Birmingham, Donner reveals the underside of American law enforcement. Frank Donner is a prominent civil liberties attorney and the author of The Un-Americans and The Age of Surveillance.